I am interested in knowing what type of wood the clothes are hanging from? Actually it is a woody vine that wraps around any tree it can. In the southern states there is a vine that grows wild and is a real nuisance..it has yellow trumpet shaped flowers in spring..for the love of me I can't spout off the name. Anyway, it wraps around anything and everything and strangles small trees that will eventually look this way as they grow. Any kind of tree will do! I will post the name when it comes to me! Where did you get the adorable dollhouse? Good eyes! It's Plan Toys, from Land of Nod. Thanks! Trying to hold off until Christmas, but it's not easy once I get an idea in my head. Mirror - Where to find this mirror? We found the mirror at a tag sale, painted it a chalky, light gray, and affixed a decal from Shanna Murray to the top. Thank you so much! The carpet was installed by the previous owners so I don't know the details. Wish I could be of more help! Hi Kelly ! sorry for barging in this post ! I am into manufacturing and supplying carpets and rugs since 1925 and are based in India. Yes , we do make rugs like the ones shown above. Love twisty wood! How do I recreate that look? Did you treat the wood? Just look out in the woods for long vines hanging from trees. Over time the vine grows as the tree grows, and the older the tree gets the better the twisted appearance. I have one that looks like it was carved by the woody vine that grew around a Maple tree. Where do I find the doll crib in this picture? - Thanks. It was a thrift store find that we repainted. Where is this mirror from? What color is the blue paint on the brick wall in the background? It is Sherwin Williams Rainwashed. This twisting branch was found by Donovan's father in some nearby woods. Cut to size and hung securely from the ceiling, it became a unique coat rack. This hanger doubles as a sculptural piece, making it as much about art as organization. It adds a whimsical touch to a girl's room. Don't let a small play nook hinder your child's creativity (or yours). 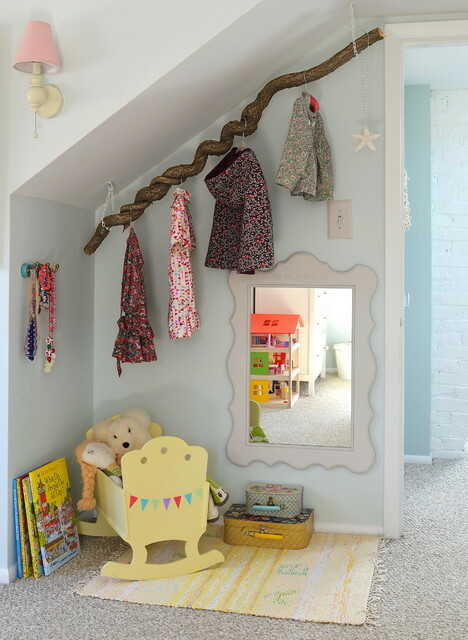 Adding a mirror that's just right for your child's height and a tree branch to hang dress- up clothes will provide hours of imaginative play. Use: Clothing rodResult: While perhaps not the most practical rod in the world, a branch is a visually interesting one and is perfect for displaying just a few favorite items in an artful way. 5. Use inspiring materials. Repurposing unusual materials, such as this branch, to display dress-ups will add a touch of pizzazz to the space. Also, notice the mirror placed low enough for children to admire their superhero or princess appearance. Get creative with sloped ceilings. If a built-in or large-scale shelving unit is either too large for your room or out of your budget, you can still add extra function by simply hanging a rack or hooks beneath a sloped ceiling. A small mirror below turns this spot into a little dressing area. Use branches as clothes racks, curtain rods and more. If you come across a branch with a good shape, take it home, clean it up and put it to work as functional decor. A twisted or gently curving branch can become a one-of-a-kind clothing rack, while a slim, straight branch can be used as a curtain rod. Smaller pieces can be turned into a mobile or simply plunked in a tall vase on the floor. How about this spectacular solution to an awkward area under the stairs? The twisty branch, or perhaps it's a piece of driftwood, placed along the slanted ceiling brings an organic feel to an otherwise dead space and creates a very functional coatrack. 4. Offer dress-up and role-play items. Playing dress-up helps children make sense of the roles they see played out around them every day by family, friends and teachers. Set aside a special corner and hang fun hats and costumes on a wall for your children to try on. Supply them with play dishes, tools and other real-life items for role play. I like turning the snakewood into a coat hanger.